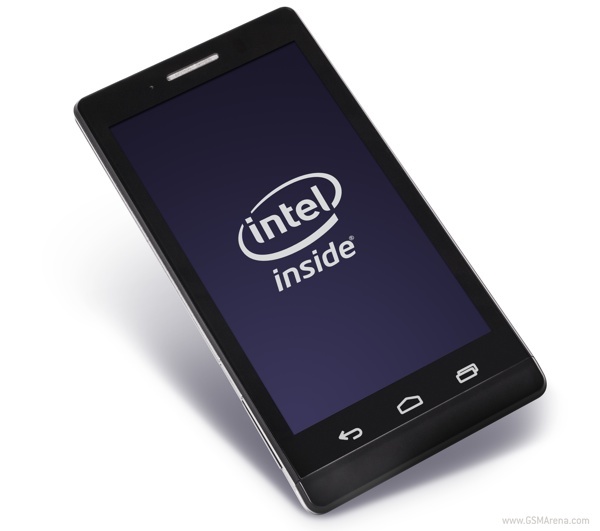 Intel has announced a new generation of their Atom processors for smartphones and tablets. Better known by the Clovertrail+ codename, the new range of SoCs promise a notable improvement over the previous generation Medfield and Clovertrail processors. Clovertrail+ SoCs will be available in three SKUs, with similar parts but varying clock speeds. The fastest is the Atom Z2580, followed by the Z2560 and the Z2520. On the CPU side, the new Clovertrail+ adds an extra Saltwell CPU core, which is based on the same 32nm processing, while maintaining Hyper Threading (so now you get four threads). 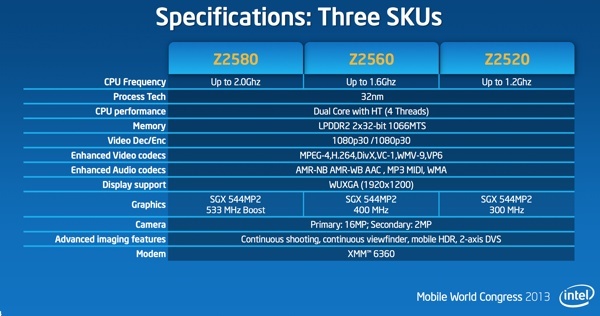 The clock speed on the Z2580 goes up to 2.0GHz, whereas on the Z2560 and Z2520 it's 1.6GHz and 1.2GHz respectively. 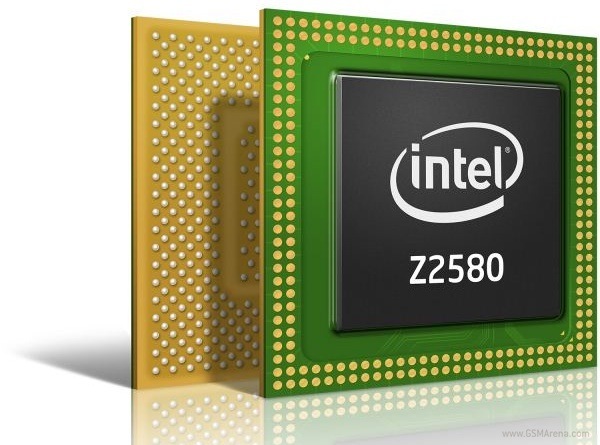 With the extra core, Intel promises 2x faster CPU performance over Medfield chips. The biggest improvement, however, comes on the GPU side. Intel gets rid of the previous PowerVR SGX540 in favor of the significantly more powerful SGX544MP2. To put it into context, this GPU is actually slightly more powerful than the one in Apple's A5X, which was found inside the third generation iPad with Retina display. Once again, the clock speeds differ across the SKUs, with the Z2580, Z2560 and the Z2520 getting 533MHz, 400MHz and 300MHz respectively. Intel claims the GPU in Clovertrail+ is thrice as fast than the previous PowerVR SHX540. The faster GPU also means the supported resolution now goes from 1,024 x 768 to 1,920 x 1,200. The memory interface in Clovertrail+ is still 2 x 32-bit LPDDR2 but at a faster 1,066MHz instead of 800MHz. The baseband has been updated from XMM 6260 to XMM 6360 and now supports 3GPP release 9 with 42Mbps DC-HSPA+ (Category 24) and HSUPA category 7 (11.5 Mbps). However, there is still no LTE support. Lastly, there is a new reference design for OEMs. It uses the Z2580 chip with 2GB of RAM, XMM 6360 baseband, 16 megapixel rear camera and 2 megapixel front camera. It runs stock Android 4.2, which can be modified by the OEM, as is often the case. The first phone to be announced running Clovertrail+ is the Lenovo K900. You can check out our hands-on with the device, along with some benchmark tests over here. was watching the youtube video review for a XOLO X500 the other day and the benchmark clearly stated 2 cores for what is the worlds second intel phone, i guess the processor was the one mentioned. powerful processor for a small phone, excellent.